So OK, this one has me beating my head against the wall! 1969 Bally 'London' bingo, in the backbox have a completely toasted resistor across contacts on the start and 25 cent relays. So, I am wondering. Does anyone out there have a 'London' where this part is not fried that you might be able to have a look and tell me what the value of this resistor should be? For reference, looking into the backbox from the rear with the door open this is located just about center on the right side inner backbox wall. Wire 41-14 does connect to the 1800 ohm 2 watt resistor at schematic location B-29(.5) but I still do not see how this would feed back to the start relay across wire 14-9. They do not appear to connect. Wire 21-3 does connect one side of the 1800 ohm resistor at B-29(.5) back to the other side of Switch F on the start relay, so something here still does not make sense. Unless this was either a botched connection during an earlier repair attempt or a change after the machine went into production. My initial inclination would be the former, but lacking some valid comparison information I am still debating. 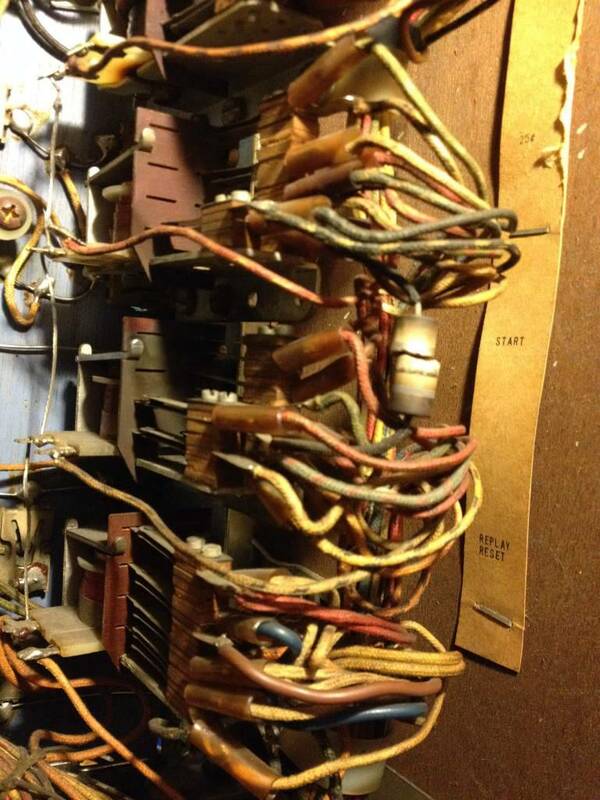 So, best (educated) guess at this point would suggest that the proper course of action would be to replace the toasted resistor with a 1800 ohm 2 watt part, and connect one end of it to the switch leaf on the 25 cent relay shared with wire 41-14 and moving the other end to the switch leaf on the start relay shared with wire 21-3. Can you scan this part of the schematic and post here please. After a long deliberation in other threads, we have come to the conclusion that high ohm resistors in EM are there to protect switches from arcing, like a diode in a modern machine. In Bally the 8.1 KΩ is used for this purpose. It would be good for all of us to see this bit of the schematic, thanks. Sounds like a plan! Here is the segment of the schematic referenced in my earlier messages. I have highlighted the components in question to make it a bit easier. Big image obviously in order to be readable. Probably want to download it. The 8.2 KΩ will be there to protect the two SWs, see it is in parallel with Cam #5 SW and Mixer #2 SW, and high resistance. I would expect the Mixer #2 coil to be something like 100Ω (high number of windings) and cycles lots. The resistor will remove EMF effect and stop arcing of the contacts of the two SWs . Now the 1800Ω, my guess , is like how a pinball flipper coil works. It allows the magnet to be high power when all 5 SWs are closed, then holds it at reduced power when only “search Wiper Cam” is closed and any of the other 4 SW are open. Like a flipper coil, to allow a longer time without burning out the ‘High Power’ coil! The 15Ω resistor, changes the brightness of the “Search light”. Remember, resistors are current limiting devices. When in parallel in a circuit like this have little to no effect on the circuit, but in series…. Have a think about my explanations, see if they work out in practice. Well, decided to go with the 'educated' guess option, (and thanks to all who have chimed in) and installed the new 1800 ohm 2 watt resistor between the start and 25 cent relays, making sure to get it on the proper side of the switches. And while it did not suddenly solve all of the machine's issues, (no real surprise there) it did show some promising signs and did not cook the new resistor so I think I am on the right track. At least with that off the list, I can go back to evaluating the machine's other issues in a reasonable manner. Small steps, but it is all progress.